We offer many public programs throughout the year to enjoy the beauty of Upham Woods in all seasons! Programs are free, open to all. OUR EARTH DAY RESTORATION PROJECT HAS BEEN RESCHEDULED TO APRIL 28, 2019! Due to site conditions caused by recent weather, the shoreline restoration project originally planned for this weekend has been rescheduled. 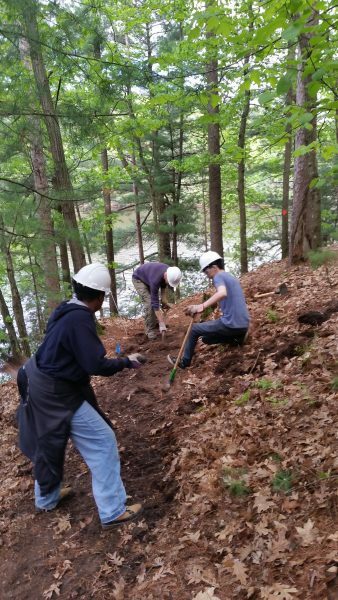 Please join us on April 28 at 1:00 pm for two hours of riparian planting followed by a hike on Blackhawk Island. Contact John Celley, 608-254-6461, john.celley@wisc.edu, with any questions. can enjoy an Upham Naturalist guided hike on Blackhawk Island. AGES: Family Program- All ages welcome! After completing an educational orientation program, annual Paddle Pass holders will be able to launch their own canoes and kayaks on the Wisconsin River using the parking lot and established shoreline access points at Upham Woods Outdoor Learning Center. A Paddle Pass is also your connection to community paddling events and land stewardship volunteer opportunities in the Upper Dells. Passholders are required to check in and out through the main office like all other visitors. It is recommended that paddlers contact Upham Woods at least 24 hours in advance of their visit to ensure that this service will be available. Weekends, mornings, and evenings can likely be accommodated with appropriate advance notice. Contact John Celley at Upham Woods, 608-254-6461, john.celley@wisc.edu, with any questions about this program. Partnership Programs with City of Wisconsin Dells Parks & Recreation Department! Upham Woods partners with the City of Wisconsin Dells Parks and Recreation Department to provide public programs for the Lake Delton/Wisconsin Dells community! Registration for partnership programs is available ONLINE through the City of Wisconsin Dells Park and Rec Event Registration website. measures, equipment, and techniques in order to gain or improve archery skills. they will be leading the activities at their site. Enjoy a paddle on the Wisconsin River with Upham Woods Outdoor Learning Center. We will be canoeing from 5:00 – 6:30 p.m. for anyone who would like to join. techniques in order to navigate the river. We will host three separate dates. All ages welcome. Upham Woods provides all the equipment.